38 pp. Roman, 667 pp. Magier, Wahrsager – Betrüger oder wahre Heiler? Soqotra – Drehscheibe für Fernhandel und Kulturtransfer vor dem Horn von Afrika? Beja – How well does the current parser analyse input texts? 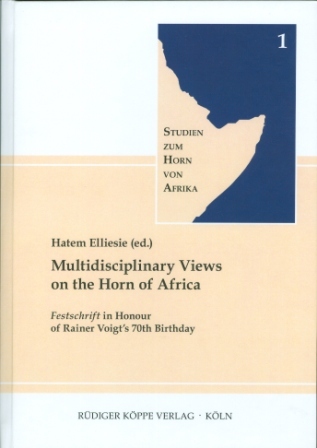 The first volume of the series ‘Studien zum Horn von Afrika’ edited by Rainer Voigt and Hatem Elliesie, is entirely devoted to the Festschrift in honour of Professor Rainer Voigt on the occasion of his 70th birthday (17th of January, 2014), which goes under the title “Multidisciplinary Views on the Horn of Africa”. As specified in the foreword by the editor Hatem Elliesie, this astounding book contains the main results of three different international conferences on the Horn of Africa, hosted by the Rainer Voigt’s chair of Semitic Studies, funded by the Freie Universität Berlin since 2009. [...] As has been said above, despite the broad range of disciplines touched by this work, it must be specified that this first volume of the “Studien zum Horn of Afrika” [sic!] series offers a first selection of the multidisciplinary aspects concerning this rich geographic and cultural area. We hope that several other volumes will follow in the future, in order to develop and enrich this manifold and seminal branch of knowledge. In addition to its contents, there are at least three reasons to consider the book under review an important contribution to Ethiopian studies. First of all, it is presented in the form of a Festschrift in honour of Rainer Voigt, one of the most distinguished Semitists and Ethiopianists, active now for more than four decades, who has contributed extensively to the investigation of Ethiopian Semitic languages as well as the Semitic and Afroasiatic at large, occasionally even beyond these limits. [...] Secondly, this book inaugurates the new series, Studien zum Horn von Afrika (four have appeared to date), published by the Rüdiger Köppe Verlag, a publisher well known to all those interested in African linguistics. The series further expands the number of scholarly contributions on the area of Ethiopian and Eritrean studies, Orbis aethiopicus, or even – with a clearly marked geographical target and with a less methodologically oriented approach – Horn of Africa studies: this aspect is quite in keeping with the heterogeneous profile of the volume. Thirdly, the book documents the scholarly activities developed by the Arbeitskreis Äthiopistik at the Freie Universität Berlin led by Voigt and coordinated by the editor, Hatem Elliesie. In fact, the Festschrift mainly consists of papers presented at three colloquia hosted by the Chair of Semitistik at the FU Berlin since 2009 [...], plus additional contributions from invited authors and fellows. Some of the latter contributions in particular bring the research in some special fields up to date, and offer a valid starting point for further research. [...] The editorial apparatus of this volume is remarkable. Very welcome is the final Index, but there is also a long list of abbreviations that would be more appropriate to an encyclopaedia than to a miscellany [...] The editor and the publishing house should be congratulated for this achievement.